Set among the vineyards at the foot of the Luberon Mountains, Bastide Saint Victor is a 5-bedroom house, 35 km from Salon-de-Provence. You have free access to the outdoor pool and a BBQ is provided. 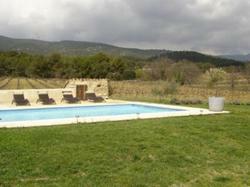 Decorated in a typical Provençal design, this holiday home has a shaded terrace in the garden. The bedrooms all have a TV and free Wi-Fi, and there are 5 bathrooms that are fitted with a shower. You can prepare meals in the spacious kitchen using the oven, gas hobs and the electric mixer. A dishwasher, coffee maker and electric kettle are also provided as well as a washing machine. With free private parking on site, this holiday home is 2 km from the centre of Lourmarin and Aix-en-Provence TGV Train Station is 40 km away. With a view of the garden and surrounding mountains, this spacious house features a seasonal outdoor pool, 2 terraces and a BBQ.